The superior thyroid artery in relation to the external carotid and its branches. 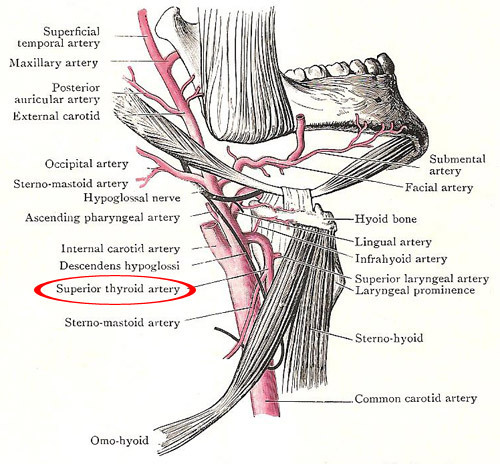 The infrahyoid artery is a small branch that runs along the lower body of the hyoid bone. The inferior laryngeal artery is a larger vessel; associating itself with the internal laryngeal nerve, it pierces the thyrohyoid membrane, enters the pharynx, and descends to the larynx. The sternomastoid branch is a small vessel which runs downwards and backwards across the carotid sheath. The cricothyroid artery is a slender branch that arises under cover of the sternothyroid muscle. It runs medially across the cricothyroid muscle on to the cricothyroid membrane, where it anastomoses with its fellow.